DermaRain Extra-Mild Shampoo & Bodywash cleanses and moisturizes sensitive skin without irritation. It is dye-free and pH balanced to ensure it is gentle on skin. 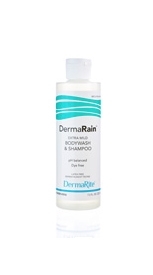 DermaRain Shampoo & Bodywash requires a water rinse.